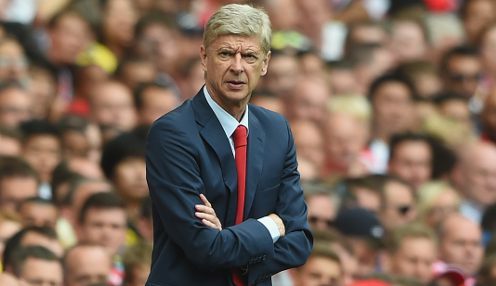 Arsene Wenger is not looking to sign a new striker for Arsenal. Arsenal boss Arsene Wenger claims he does not need to sign a new striker this summer following his side's 6-0 friendly mauling of Lyon. The French tactician watched as goals from Olivier Giroud, Alex Oxlade-Chamberlain, Alex Iwobi, Aaron Ramsey, Mesut Ozil and Santi Cazorla helped the Gunners comfortably see off their French Ligue 1 opponents at the Emirates Stadium on Saturday. When you win the FA Cup final scoring four goals and score six today, it shows scoring goals is not our problem. And Wenger used the win to hit back at critics who claim he needs to bring in some more firepower having only signed goalkeeper Peter Cech from London rivals Chelsea so far in this transfer window. On Arsenal, who hit a third highest 71 goals in the Premier League last term, Wenger said: "We are open-minded but we are not desperate. Today we didn't have (Danny) Welbeck or (Alexis) Sanchez, who are big players. "(Jack) Wilshere didn't play as well, so we will have a good squad when everyone is back. We are open-minded but many clubs are on the market with big, big money. "At the moment our squad is well-balanced quality-wise and numbers-wise. "When you win the FA Cup final scoring four goals and score six today, it shows scoring goals is not our problem." Wenger also believes that Arsenal will be better prepared for this new season given that last year several of his players were heavily involved on World Cup duty in Brazil until mid-July. "I think we have more cohesion than we had last season and everyone has better focus," he added. "Last season after the World Cup some players came back mentally exhausted. Hopefully we can take advantage this season. "Football is subtle, it's not mathematics. That means everyone playing for each other, then if you have quality players you have a chance." Arsenal are 1/1 to win the Premier League this season, while they are 1/1 to secure a top-four finish.